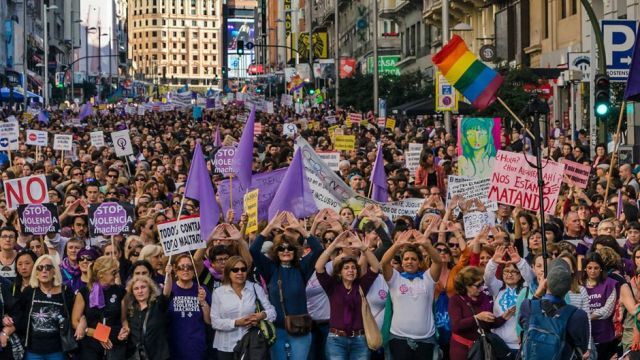 Tens of thousands of demonstrators calling for government action to end domestic violence against women took to the streets in Madrid in a historic march on 7 November, just a few weeks before the International Day for the Elimination of Violence against Women on 25 November. Members of 380 regional and 70 national feminist organizations marched in solidarity with representatives of political parties and trade unions, non-governmental organizations, and concerned members of the public. People came from across Spain to attend the march, bringing much-needed visibility to a problem that is often absent from the public eye because it is dismissed as a private concern to be dealt with behind closed doors. By occupying the public space, survivors and activists together are sending a message to victims that they can speak out, and simultaneously demanding that the government acknowledge domestic violence as a public issue. Such public action is especially important for migrant women, who often suffer from a social invisibility that can mean that concerns about protecting their rights are easily ignored. Gendered power relations are reproduced and exacerbated during migration, which leaves women even more susceptible to all forms of gender-based violence during the migration process. Alongside important discussions about ending gender-based violence targeting women in refugee camps, it is essential to consider the everyday violence some immigrant women suffer when settling in a new country. The feminization of migration reveals more women migrating independently, but a significant number of women still migrate for family reunification and marriage, meaning their residency in the new country is dependent on their partner. Additionally, when women are unable to work for themselves due to their dependent residency status, it makes them more socially isolated and more vulnerable to an abusive partner. A 2012 report by Human Rights Watch considers the case of migrant women in Belgium who are victims of domestic violence. Although Belgium has mechanisms in place to protect victims of domestic abuse, including a National Action Plan and state and charity- run shelters, the report reveals that migrant women have trouble accessing such services and in some cases are even deported after reporting abuse. The situation in Belgium is not unique; it is just one example of the many states in which adequate legal provisions have not been made or implemented in such as way as to protect migrant women who are victims of domestic violence. Any woman suffering from domestic abuse struggles with how to handle the situation. The problem is doubly difficult for immigrant women, who face additional barriers to reporting violence and accessing services. First, there is the difficulty of reporting domestic abuse. Immigrant women, particularly those who have arrived recently, may lack the familiarity with the language and public services necessary for seeking help. Additionally, there is a fear among women who migrate for family reunification, marriage, or without proper documents that if they report the abuse they may lose their residency status or be deported. In many European Union countries, people who migrate to join a partner who is an EU national or long-term resident must wait several months following their arrival for their family reunification application to be processed, and then they are granted a conditional residence permit for a certain number of years. If the relationship ends before this probationary period is over, the dependent partner loses their residency rights and must leave the country. Some states have adopted laws allowing exceptions for partners that split due to abuse, but this is not yet universal. For undocumented women who do come forward to report domestic violence, they lack options for obtaining legal status. In the previously mentioned research by Human Rights Watch, some migrant women in Belgium who reported cases of abuse and then separated from their abusive partner subsequently received expulsion orders for not respecting the conditions of their provisional residency. Even when migrant women do report domestic abuse, they face obstacles to accessing services. Lack of space in shelters is problematic for all victims of domestic abuse, but particularly so for migrant women who may not have a network of friends and family to fall back on if a shelter is unable to accommodate them. Because of the exacerbated difficulties in reporting domestic violence and accessing protective and legal services, as well as due to the fear of deportation, many migrant women suffer in silence. Actions are being taken at the international, national and local levels to address violence against women, and special provisions and services for migrant women should be included. At the regional level, the Council of Europe has adopted the Convention on Preventing and Combating Violence against Women and Domestic Violence, which went into effect in 2014. Importantly, this Convention has a non-discrimination provision that specifies that “the implementation of the provisions of this Convention by the Parties, in particular measures to protect the rights of victims, shall be secured without discrimination on any ground such as… migrant or refugee status”. This provision protects women whose residency permits are still being processed or are in the probationary period, as well as undocumented women, from suffering a secondary victimization of losing their residency status or being deported because they report domestic abuse. However, only 18 of the 47 member states of the Council of Europe have ratified the convention and thus, in the 29 states that have not yet ratified the Convention, it is not enforceable. Putting these legal mechanisms in place is essential to protect all domestic violence victims. Legal solutions are an important step, but they are not a complete solution. Gender mainstreaming in policy is an integral step to ensure that women´s rights are particularly protected. Implementation remains a major challenge, and even once that has been achieved, migrant women may be unaware of the legal protections to which they are entitled. Information about victims´ rights and access to legal and protective services is only useful if it is readily available and accessible in languages migrant women understand. To advance implementation of protective legal measures and increase awareness, several non-governmental organizations at the national level are developing materials. Additionally, the media plays a vital role in increasing awareness of both the problem of domestic violence and the available solutions. As the world mobilizes against gender-based violence against women this 25 November, and throughout the 16 Days of Activism Against Gender Violence Campaign, migrant women must be empowered to denounce domestic violence and access appropriate support. Ending Violence Against Migrant Women by Janina Pescinski is licensed under a Creative Commons Attribution-NonCommercial 4.0 International License.